Nowadays, RGB has been the craze. Almost every part (if not all), accessory or component of a PC has RGB. Custom liquid cooling solution has been around for many years. CPU water blocks from the old days don’t have any LED lighting. Some are transparent though, so that you’ll see the liquid passing through. After that, we see CPU water blocks with LED illumination and I’m sure you know what comes next after simple single color LED lighting -> RGB. 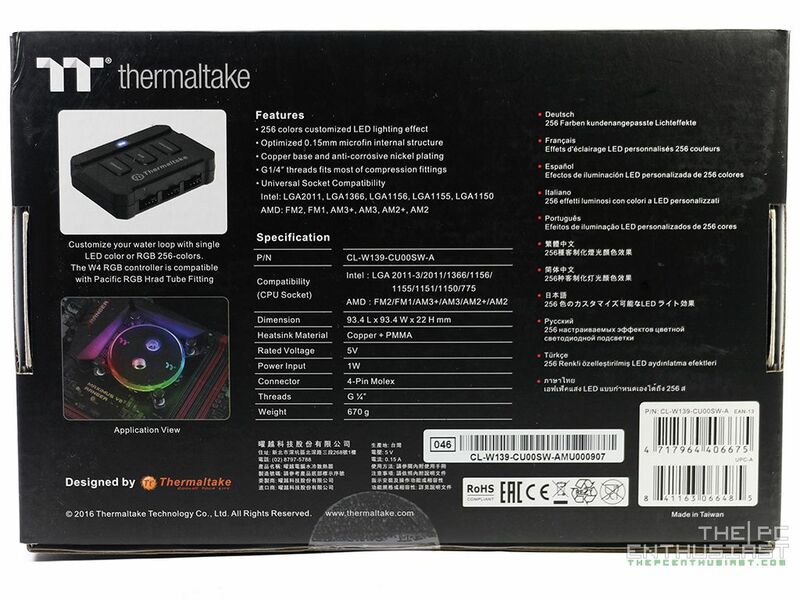 Today we are going to look at and review the Thermaltake Pacific W4 RGB CPU Water Block. It’s the company’s successor to W1, W2 and W3 CPU water blocks; this time adding RGB 256 colors around the CPU area. Most probably by now, you have encountered or saw this CPU water block from a custom build and you’re just curious if it’s any good before pulling the trigger in getting one. 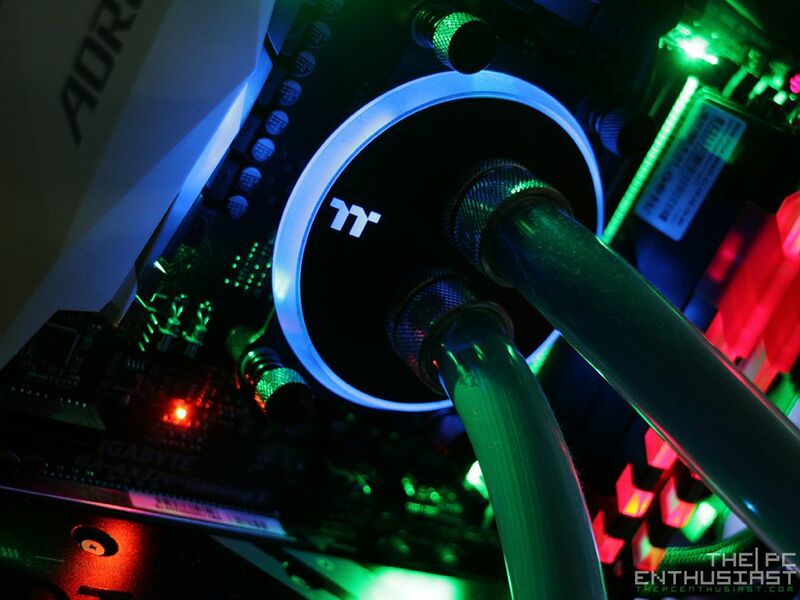 Well stick around and continue reading our Thermaltake Pacific W4 RGB CPU water block review below and find out. 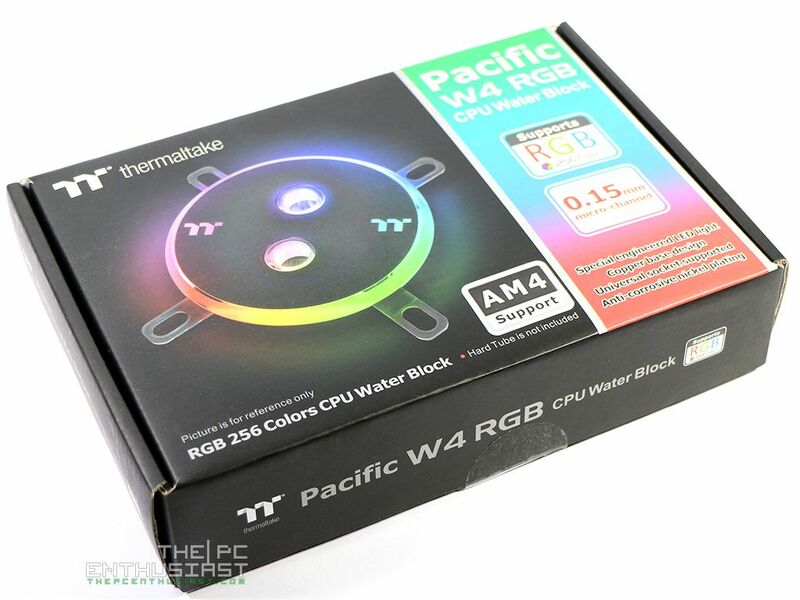 The Thermaltake Pacific W4 RGB CPU water block is the company’s 4th generation CPU water block. 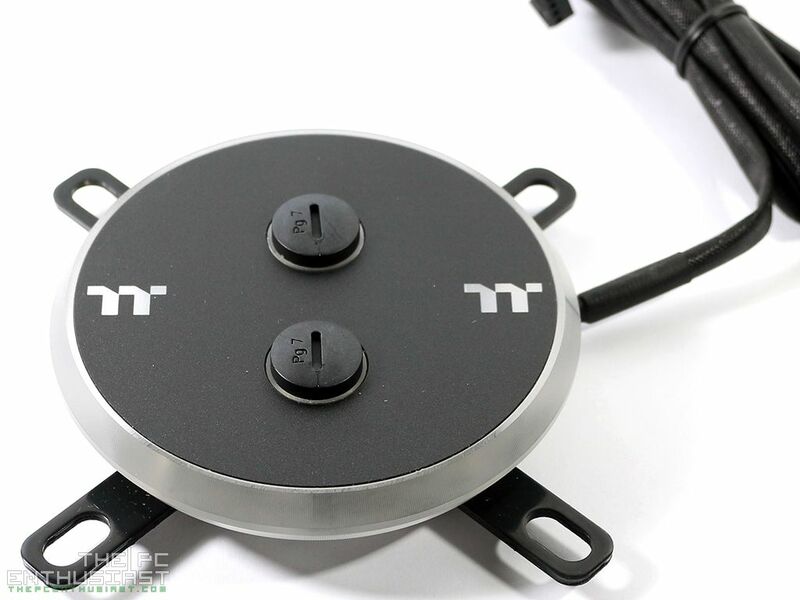 The W1 is a plain CPU water block included on their Pacific RL custom water cooling kit. The W2 comes with LED lighting and the W3 has a transparent acrylic face plate. 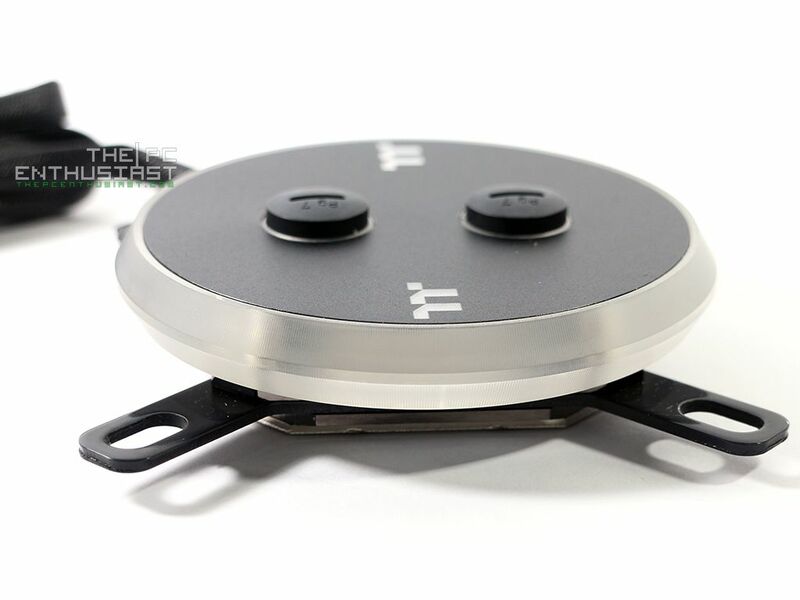 The W4 CPU water block, aside from RGB lighting, features 0.15mm internal fin construction and a copper base with anti-corrosive nickel plating. 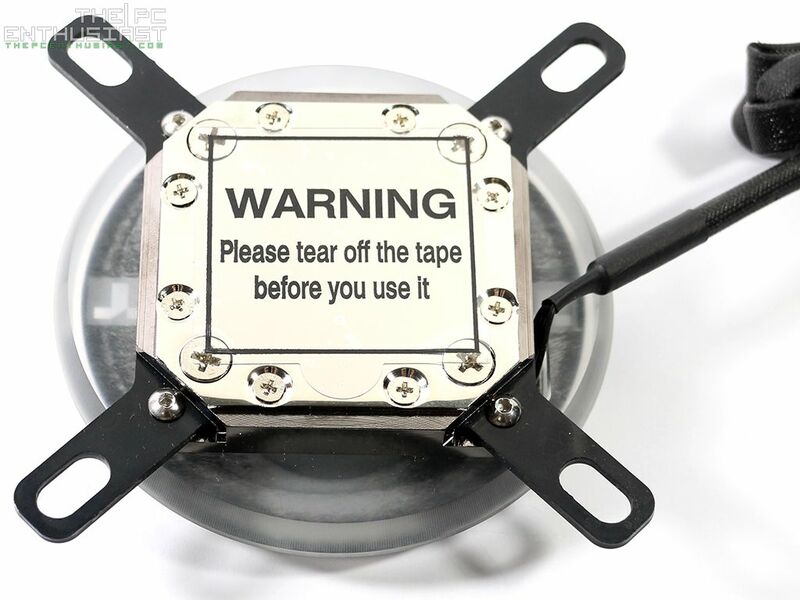 Its cover is made of high-quality PMMA cover and it uses a universal mounting mechanism. 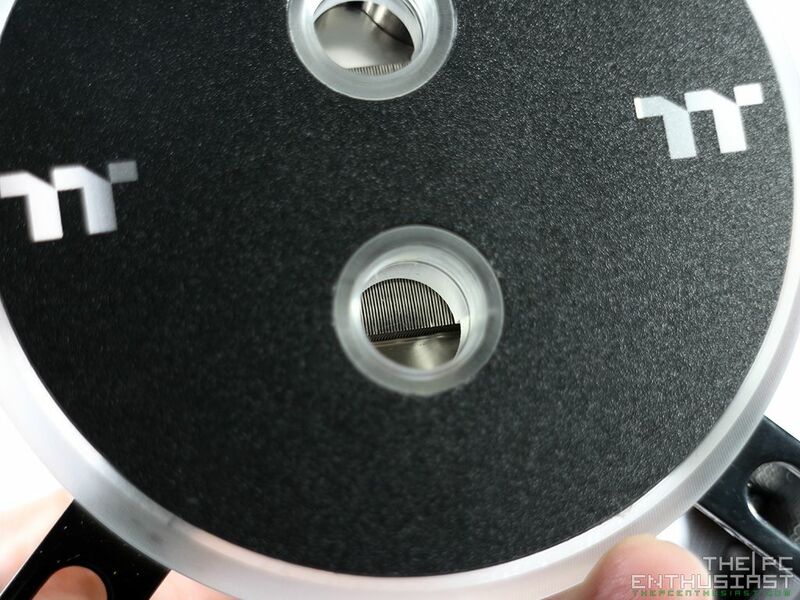 The W4’s mounting is compatible with TT’s AM4 upgrade kit and you will need that if you plan to use the W4 on an AM4 motherboard. Although, I’m not sure if it’s compatible or if there’s a mounting kit for the new TR4 socket on the X399 motherboards. The W4 also uses the commonly used G1/4 fittings; so finding compatible fittings will not be difficult. 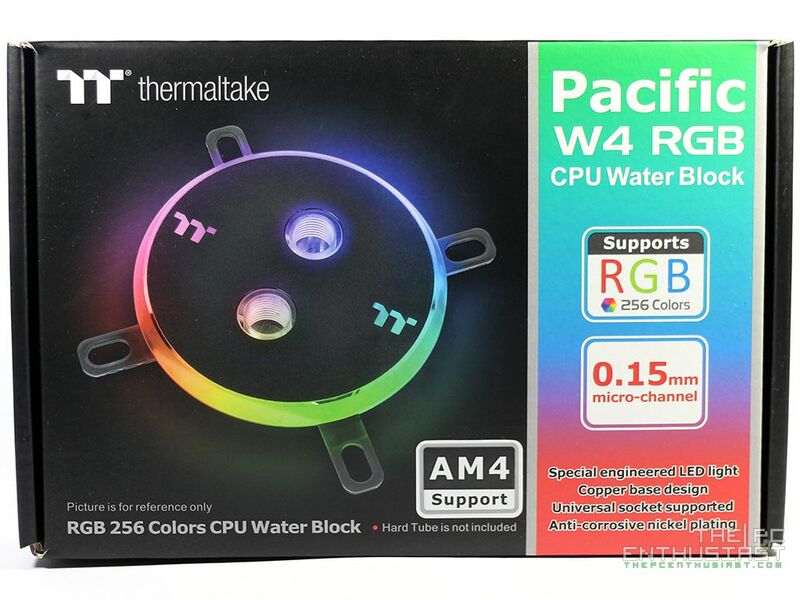 As advertised by Thermaltake, the Pacific W4 CPU water block features RGB lighting with up to 256 colors. Well if you think the W4 has a rainbow effect or “color wave” effect like the one you see on the photo below, you might be a bit disappointed (like me). In terms of lighting effects, you can choose from 7 static colors; namely Blue, Green, Red, White, Orange, Yellow and Purple. And there’s also the 256 RGB color cycle mode and the LED off mode. That’s about it in terms of lighting, and you can adjust the brightness of the LED. 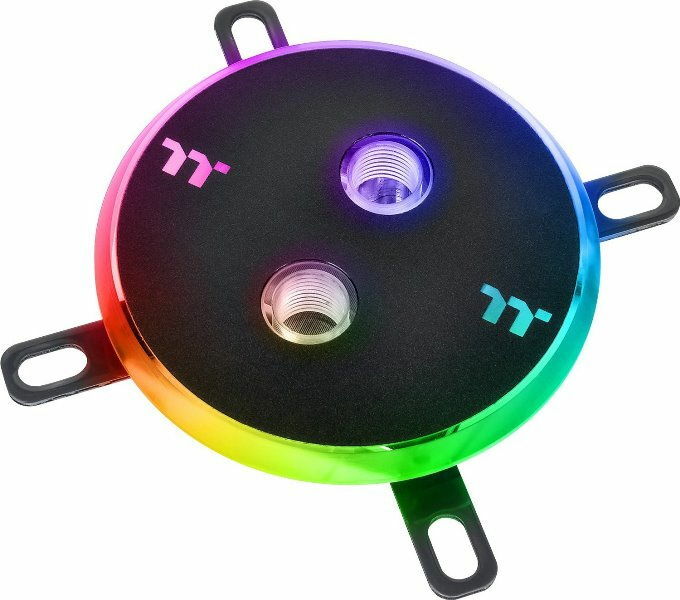 I think Thermaltake plans to release a PLUS version of the W4, where it will have more RGB effects, similar to their Riing PLUS fans. By the way, the lighting effect is controlled by a controller; similar to a controller they used on their Riing fans. The controller has a built-in memory that saves the applied color; so that every time you turn on your system, the color stays the same. Below is a specifications table of the W4 CPU water block and after that let’s proceed and take a closer look at the product itself. 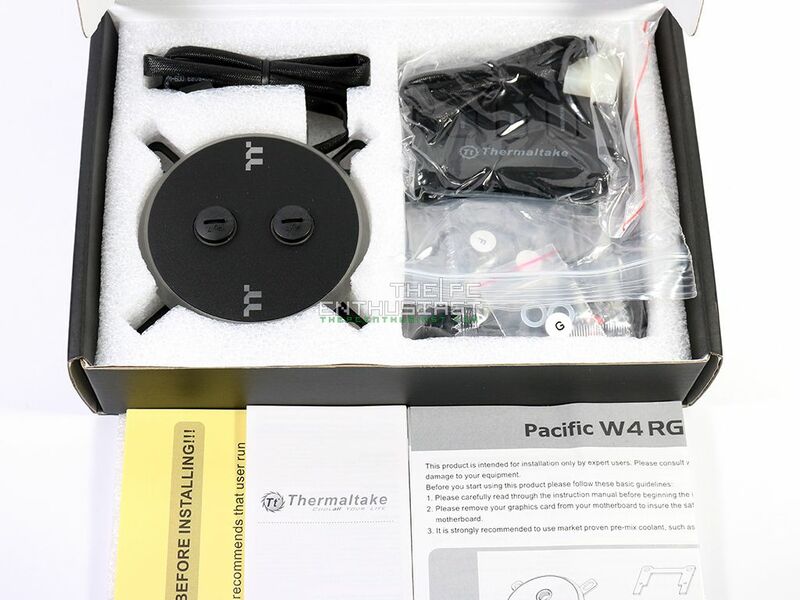 The Thermaltake Pacific W4 RGB CPU water block comes in a small black box. Its features and specifications are printed at the back side of the box. Again, the W4 RGB is not capable of rainbow effect like the one you see on the box and on the “application view” at the back. It’s just their way of showing that it has RGB lighting. The box contains all the necessary things you need to set up and connect the W4 CPU water block to your system and to your custom loop. It even comes with a small thermal paste. 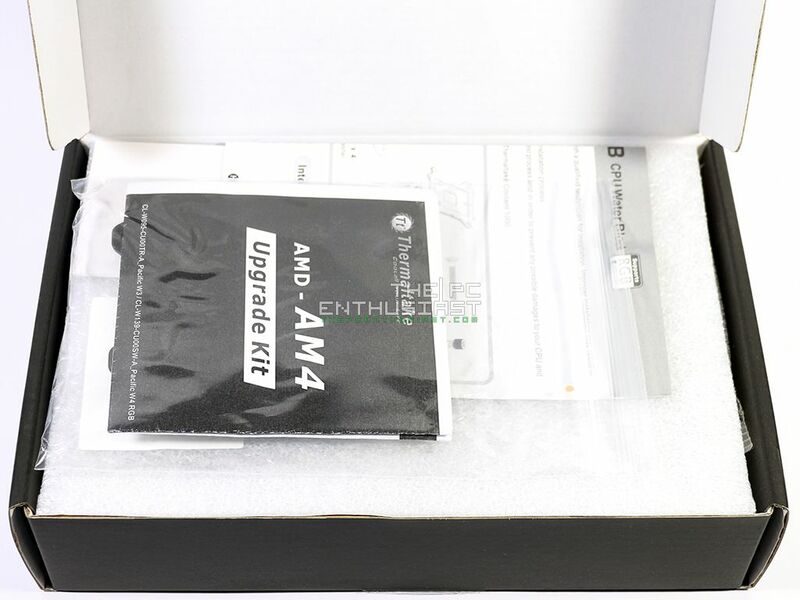 However, I am not 100% sure if the AM4 upgrade kit is also included in the retail packaging. There are also some reading materials that I highly suggest you read and pay attention before you start to build your custom loop. 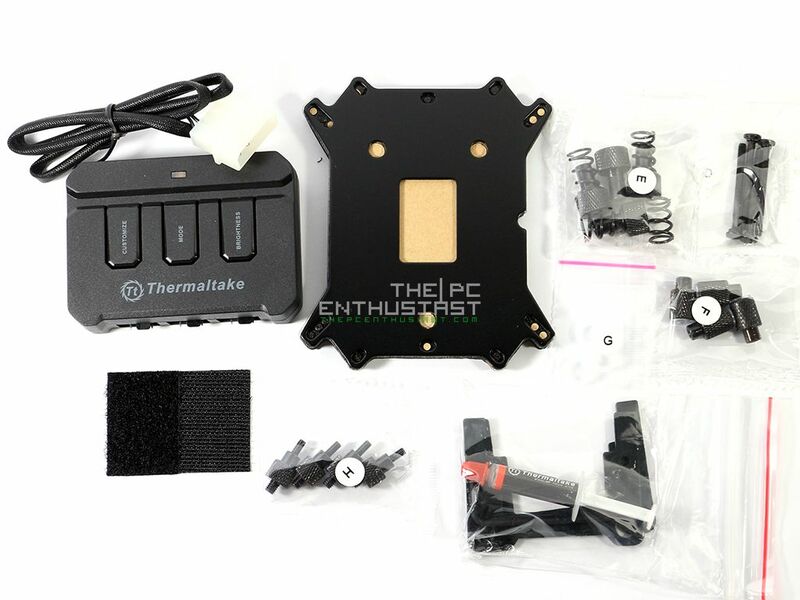 That is, if ever this is also your first time in doing a custom loop or if this is your first time using a Thermaltake CPU water block. 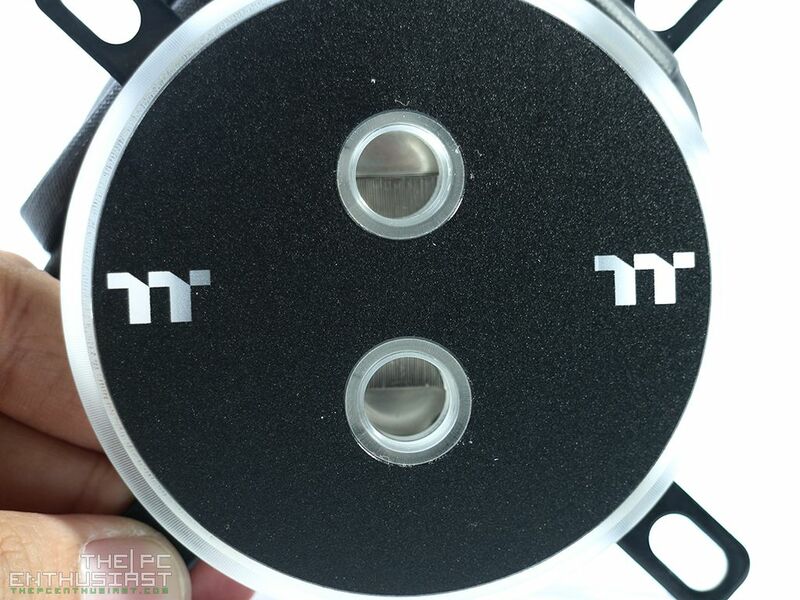 Above you can see the front and rear view of the W4 water block. The top portion is made of PMMA cover, while the base is copper with anti-corrosive nickel plating and has “absolute mirror finish”. 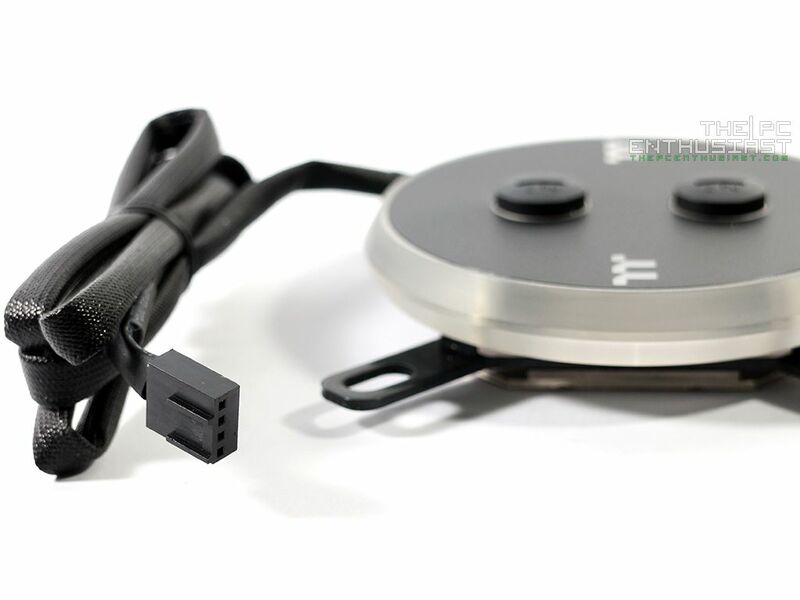 The Pacific W4 CPU water block has a sleeved cable with a plug for a 4-pin header; the cable is to be connected to its controller to control the LED lighting effects. You can also see from the sides that it’s translucent with tiny grooves; however I find that the material they used doesn’t defuse the light evenly across the circle. Here’s a closer look at the G1/4 fittings and another picture for a closer look at the 0.15mm micro-channel fin construction. I did not open or dismantle the whole thing, because I haven’t tested it yet at the time I took those pictures. I may (accidentally) damage or break the water block and we definitely do not want that to happen. Let’s proceed to the next page for the test setup and the temperatures we got with the W4.